Today we celebrate the 237th year of United States Independence. For most, the day is not recognized or celebrated for our separation from England. The 4th of July is a glorious celebration of red, white and blue flags and banners waving at the beach, picnic, barbecue, summer fun and fireworks. How are you spending your Independence Day? We are declaring independence from moving! No unpacking, cleaning, organizing, building, shopping or arranging today. At least for a few hours. Today, we are blindly following a lead that promises an ideal swimming hole for our first dip in the Spokane River. We’ll barbecue at home then make our way to see the Spokane Fireworks Extravaganza at Riverfront Park. Simple fun and good food are the makings for a good day ahead. Whatever your plan is for the day, I wish you and your family a Happy 4th of July! Go USA, long may our flag wave. Did you know that I am a huge fan of Ball Mason Jars? This year, Ball is commemorating their 100th Anniversary by recreating blue colored mason jars like the jars they made years ago, specifically from 1898 – 1937. 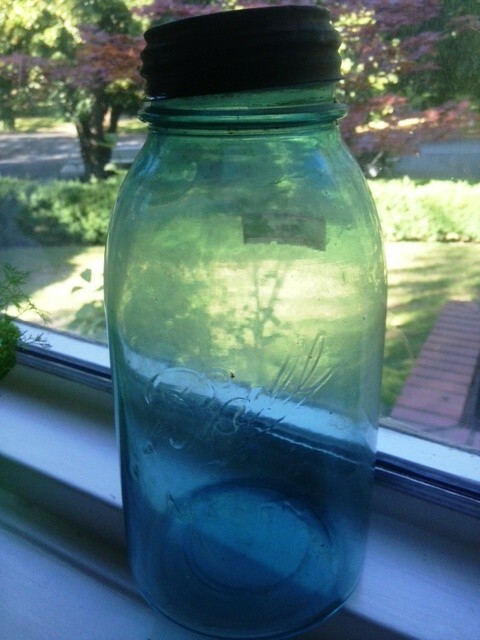 Not only do the jars have a symbolic nod to their past, their blue hue is very timely for 4th of July festivities. Smart marketing! I have no time to can or jam at the moment, but canning and jamming are weighing heavily on my mind. I need to get this house in order so I can get stocking up for winter. This week, we spent time in the basement of our 1942 home, checking out exciting stuff like the mechanical room, available storage, and because it is a partially finished basement, the 3′-4′ crawl space showing the exposed pipes and other eye-crossing stuff. I really didn’t do anything other than enjoy the twenty degree cooler temperatures found in the basement compared to the 100+ degree temperatures in the rest of the house and outside. Vince, on the other hand, was grumbling and puzzled why contractors or previous owners did the wacky building or repair jobs. The curse of being a general contractor. To me, it looks like a bunch of working pipes and wires. To him, it is a jumbled Rubik’s cube begging to be corrected. Whatever, do what you want, I’m chillin’. Eventually I surfaced to the main level to deal with the seeminly unending supply of boxes. Vince ventured upstairs later with the boys in tow, tracking me down in the living room declaring that he had a gift for me. Had to be a dead rat or something horrid if they were all interested, I thought. The gift turned out to be an old half gallon blue ball mason jar! Internet research tells me that Ball stopped making blue mason jars sometime around 1937. The lid is zinc, and the #3 is the mold number used to form the jar. 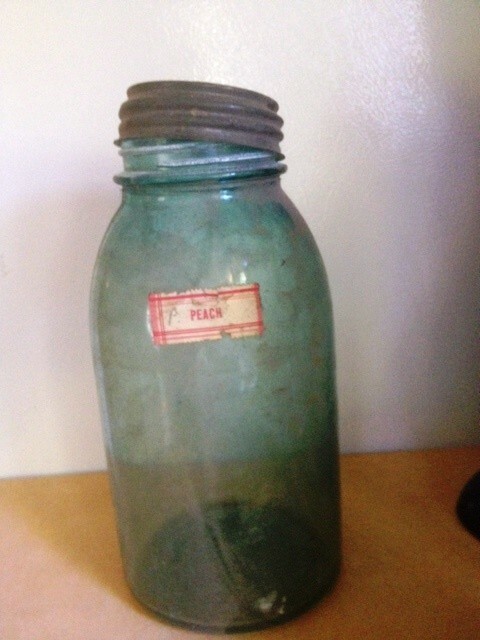 Peach-something was once housed in the jar but no more. Based on what I know, the jar is at least 76 years old. US Independence was declared in 1776. Looks to me like I have a new 4th of July decoration to treasure.